Wholesale Travel Club - Any Legit Companies Out There? Wholesale Travel Club – Any Legit Companies Out There? There are plenty of deals online but how does it compare to an actual wholesale travel club? There are hundreds of websites based around the world. Only a few are truly global in their outreach. There are scores of aggregator websites too. You can conveniently compare dozens of deals for the same hotel for the same dates and with the same included services in some cases. You must have explored such websites only to realize that they all have similar deals. Apparently, every website seems to have the best deals and all travel companies promise to price match guarantee. This begs a serious question. How special are such deals if every online travel company offers the same propositions? A wholesale travel club is not an ordinary travel website. It is not a run of the mill reservation service. A travel club has to be exclusive in some way. It is not necessary for the club to be accessible to only a few kinds of travelers. It does not have to be an elite congregation of businesses. However, the deals cannot be ordinary. The deals available through a wholesale travel club should be special and not the usually discounted tariffs that are abundantly available online and some are also accessible offline. The challenge is to find such a wholesale travel club that does not demand a hefty upfront fee or deposit. Then there are relevancy issues such as whether or not the wholesale travel club has enough properties at a location where you may wish to stay, if the network of hotels spans the entire globe, if the quality of service is reliable and if you can actually use the deals at the right time. If you are looking for a wholesale travel club that actually delivers on its promises and whose inventory would be relevant for your needs, then the numero uno choice is Wholesale Hotels Group. The company specializes in wholesale hotel tariffs. While the modus operandi is simple when it comes to buying accommodation in bulk at properties across the world, it is how the company offers the same deals to individual travelers, businesses or corporate entities, travel agencies and professionals among others that make the real difference. You can access exclusive deals that are not available on the usual travel websites. You can choose the level of access depending on your needs. A wholesale travel club should have appropriate propositions for different requirements and that is what Wholesale Hotels Group delivers. You can know plenty of travel experts, they all have their own sources and their own “go-to” sites when it comes to finding a cheap hotel deal, but when you connect to Wholesale Hotels Group’s platform, you immediately get pricing and inventory from most well-known wholesale hotel suppliers real-time! Pricing starts from $4.99 FOR A LIMITED TIME and you can also get a glimpse before paying into the price of your hotel rooms. IMPORTANT: The price you see is the price you pay with us and that’s the amount that will be charged to your card even on the listing page! INDEED! NO MORE SURPRISES!!! Just click on the image below and sign up NOW! Annual plans are as low as $89.99 but if you are referred by a friend and this is your first membership, you can expect an annual rate for as low as $45! Are you a bonafide Travel Professional? Apply on our site for a complimentary membership by clicking HERE! 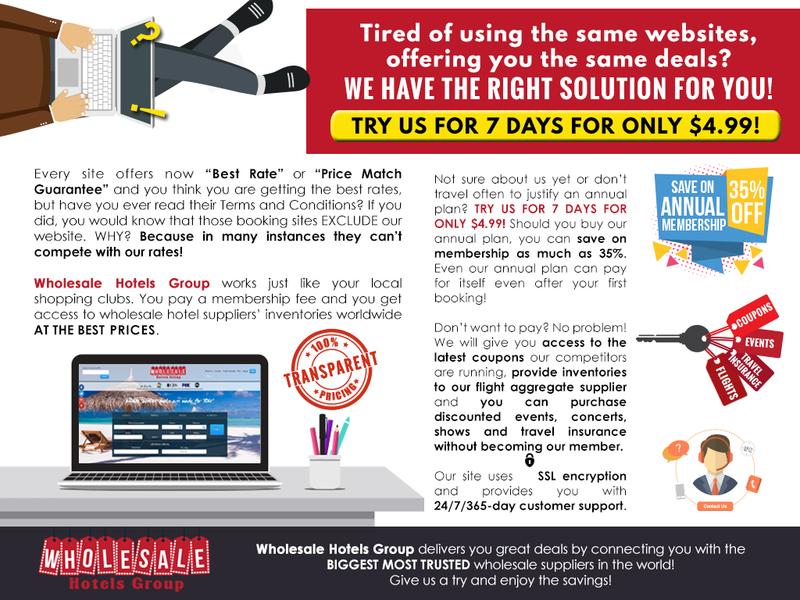 Wholesale Hotels Group – Wholesale Travel Club provides one of the best hotel room deals in the market!